I began piano lessons at the age of four. During my teens, I developed an intense passion for the classical guitar. This led to a career as a guitar instructor in Yamaha Music School for 20 years. To explore my musical capabilities further, I took an interest in the harp during my early thirties and has over the years developed a personal and distinctive style of playing classical and popular pieces on the harp by ear. 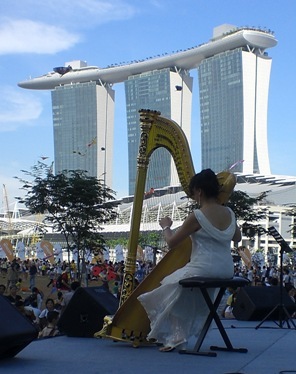 I was the harpist at The Oriental, Singapore ( 1992 -1993 ), Hyatt Regency ( 1995 -1996 ), The Inter-Continental, Singapore ( 1997 - 2003 ) and The Regent ( 2004 - 2006 ). My work requirements and experience resulted in an extensive repertoire of self-arranged classical pieces, sentimental oldies, themes from musicals and movies, popular Asian melodies, Christmas songs and carols as well as my own original compositions. I have recorded 3 CDs entitled A Harpist's Dream, Two Harps For Christmas and Angel. Besides teaching harp and guitar privately, I perform frequently for outdoor and indoor wedding solemnizations, wedding banquets, corporate events, state functions, product launches, birthday and anniversary celebrations and home parties.